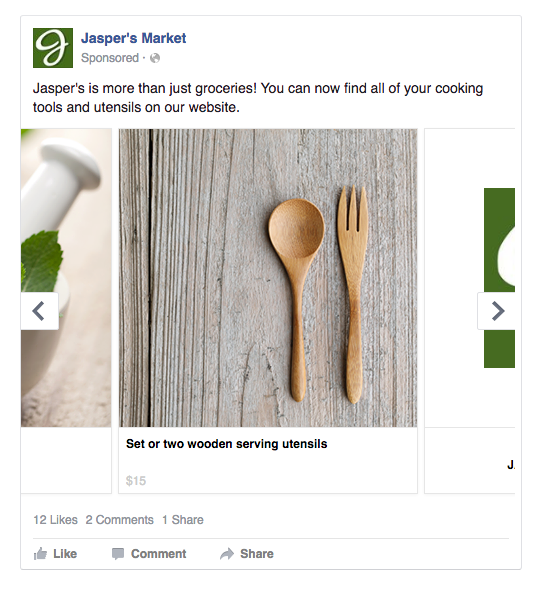 There are a couple of new Facebook formats that advertisers can now take advantage of. The Carousel format is available on both Facebook and Instagram. The user can swipe through multiple screens from one advertiser. This creates a new way to present your product and is great for telling a story. For example, you could develop a narrative through each sequential image, or link images together in a panorama to share a bigger story. Ensure you use imagery that will capture your audience’s attention so they want to keep swiping and will remember what you are advertising. It’s also important the creative is consistent, as if it is disjointed the audience will lose interest. Use copy to amplify the creative and encourage the audience to keep swiping. Make your audience want to keep swiping. For example; your first video could tease to your second, or the creative could be split across each screen. As with any effective advertising campaign, you need to have a strong call to action that connects with the creative and gets your audience to where you want them to be – whether this be to your website, Facebook page or physically in-store. Canvas allows the advertiser to use a variety of different multimedia formats in one ad – such as videos, still images, and call to action buttons. For example; the user can swipe through a carousel of images, tilt to view panoramic images and zoom in to view images in detail. This creates a whole interactive experience for the user, and is a great way to showcase depth of brand and make the audience feel part of something. It is like having a mini website right there on Facebook, staring your target audience in the face! New Zealanders will soon be able to get access to Facebook’s monetised videos. For the past decade, the big player in video monetisation has been YouTube, and for the first time, YouTube faces a competitor that matches its reach. Just like with YouTube videos, Facebook will share revenue from monetised videos with their creators; with 55% of the earnings going to the creator and 45% to Facebook. In a survey conducted by RBC Capital Markets and Advertising Age, 12% of US marketers had already joined Facebook in monetised video ads and an additional 57% are likely to do the same in the next six months. Facebook’s monetised videos are due to hit our shores very soon, giving even more reason for brands to create smart, savvy, unique, and highly-engaging content.